In partnership with the Consulate General of France in Los Angeles, PEN America and UCLA’s Department of French & Francophone Studies present the panel, Climaticism: Literature in the Era of Global Warming, with Philippe Rahm, Caroline Ford, and Karen Tei Yamashita, moderated by Dominic Thomas at this year’s Night of Ideas at the Natural History Museum of Los Angeles. 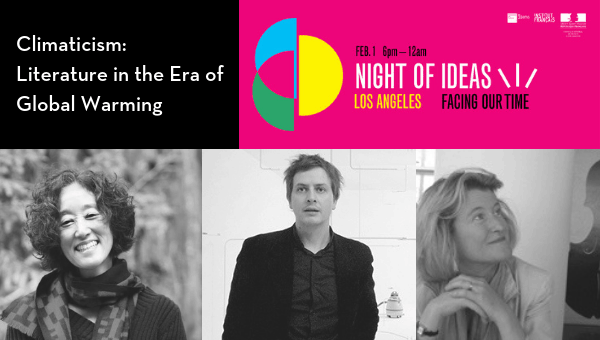 Night of Ideas is a worldwide event that celebrates the stream of ideas between countries, cultures, and generations. Each year, people around the globe come together to learn about and discuss the latest discoveries and issues facing the world today. This year’s theme, Facing Our Time, explores global challenges around ecological and climate change through the lenses of science, nature, and art.